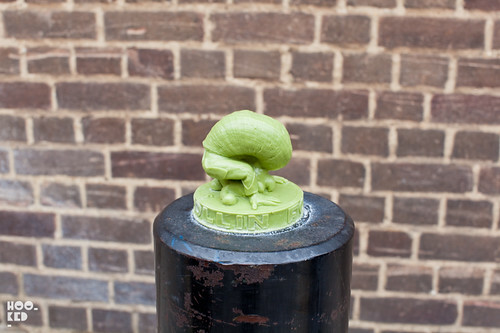 We have been seeing these miniature resin 3d street art pieces for some time now around East London, in various colours and often in clusters stuck to walls, building and various other street furniture. Recently the pieces have gotten considerably larger such as those pictured, with each one featuring the 'Rolling Fool' character. At first we assumed the various pieces we were seeing around London were all identical considering the detail in each, but from our recent set of pictures we realised they were numbered and each of the ones we found featuring the character in a different pose. 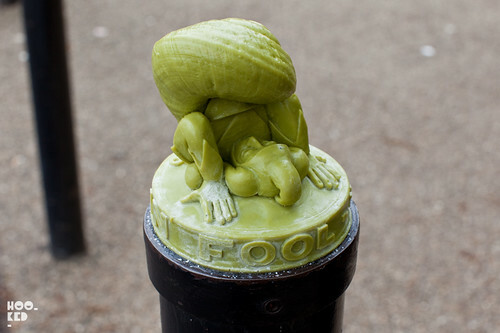 With each piece embossed around the base with the words Rolling Fool Youtube, a quick search lead us to the video below which features these cement sticker characters in different locations right across London, with each one photographed and made into a clever street art animation. The work it seems is that of an artist calling himself Dr. Cream and his Jester Quester street art project would appear to be an urban art and photography quest that is interlinked via the search engines of Google, Flickr and Youtube. 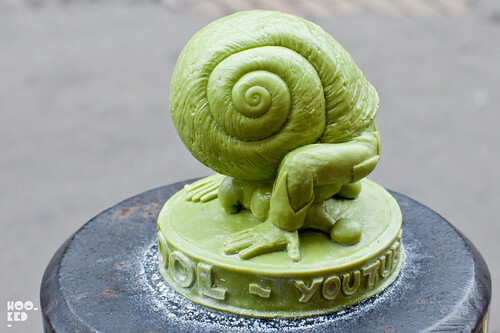 More info in the videos on the artist's Youtube channel here.